Aberdeen round off the pre-split fixtures by making the relatively short trip to The Kilmac Stadium at Dens Park to face Dundee in matchday 33. The Dons were able to overcome Motherwell on Wednesday night claiming their first home win since the end of December and a welcome three points meant they went level on points with third placed Kilmarnock. After the weekend’s fixtures the league splits, but their opponents, Dundee will be looking for a victory to help in their battle to avoid the drop. Jim McIntyre’s side sit bottom of the table two points adrift of St Mirren and six off Hamilton Accies having lost 2-0 to St Johnstone in midweek. Ahead of the match Derek McInnes and captain Graeme Shinnie spoke with the media on Friday lunchtime. “I think the Celtic defeat in particular was really harsh on them. Being at home the last time out I thought they were very good in that game and were unfortunate not to get something from the game. They’ve had a couple of disappointing since that, which can happen, but I know Jim well and I know how determined he is to get things right at Dundee. “Especially going into the split after it’s important we go down to Dundee and get the three points to put us in as strong a position we can. We’re coming off the back of a good result against Motherwell so it’s one we want to continue and get another win. “There’s always that belief in the squad. We know what we’re capable of and it’s about going and doing it, which has been the frustrating part. We know what we’ve got in the squad and we’ve not shown it enough especially in the games at home. It’s important we go down and play as well as we can at Dundee and try come away with the win. There’s a three way battle to avoid relegation from this season’s Premiership with Dundee, Hamilton Accies and St Mirren all vying for that 10th place finish, which would guarantee safety. Last weekend St Mirren came from behind in a 2-1 win to leapfrog the Tayside club, but all three sides lost in midweek, which keeps the battle boiling. On the second weekend of the season, The Dons travelled to Dens in a good frame of mind having grabbed a late equaliser the week before against Rangers. It proved to be a tight affair in the City of Discovery with few chances being created from either side. The hosts were wasteful in the final third and Aberdeen made them pay when Gary Mackay-Steven slotted home a penalty with 15 minutes remaining which was enough to claim the points. The last meeting came in December and The Dons were in a rich vein of form going into it. Sam Cosgrove picked up from where he left off at St Mirren the match before when he nodded home Connor McLennan’s cross in the 16th minute. The hosts then doubled their lead when Sam grabbed his second just before the break with a strike that epitomised the confidence he was playing with. Andy Considine killed the game off five minutes after the break when he found himself unmarked at a Niall McGinn corner. McGinn was provider again six minutes later when he crossed for the onrushing McLennan who volleyed home from twelve yards. Dundee did get one back when Calvin Miller riffled one in from long range. The Dons restored their four goal advantage when Considine again headed in from a corner. 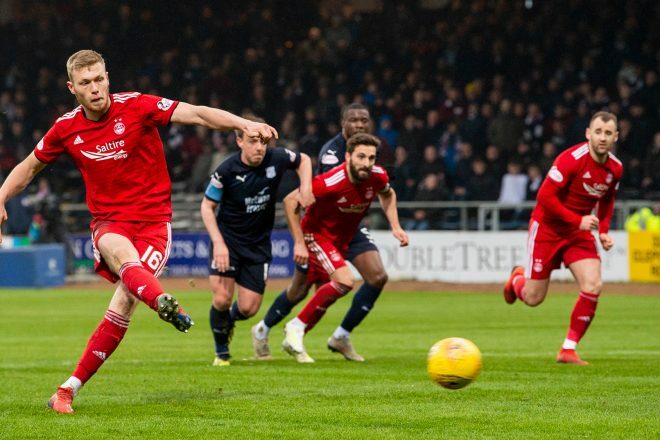 The defender was searching for a second hatrick against Dundee but it never came and Aberdeen settled for 5-1 – their most convincing display of the season. 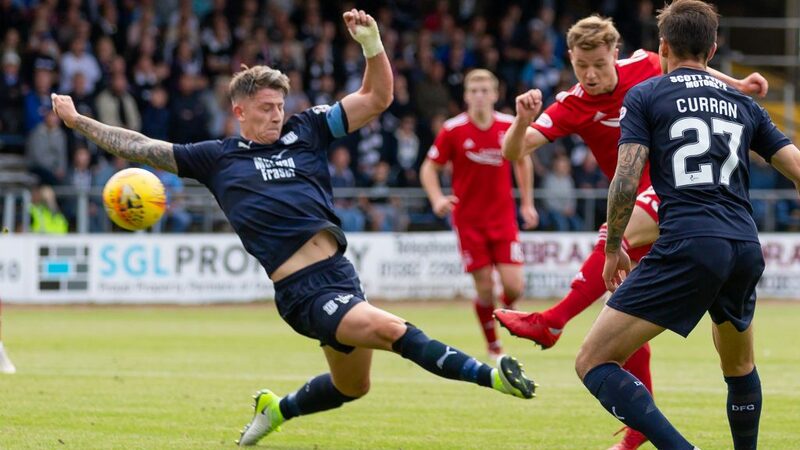 Saturday will mark the 107th league match between Dundee and The Dons at Dens Park and it’s the visitors who hold the better record with 46 wins. There have been 35 draws with Dundee winning on 46 occasions. The Dons are currently on a five match winning streak at Dens and if you include visits across the road at Tannadice the number is at seven. 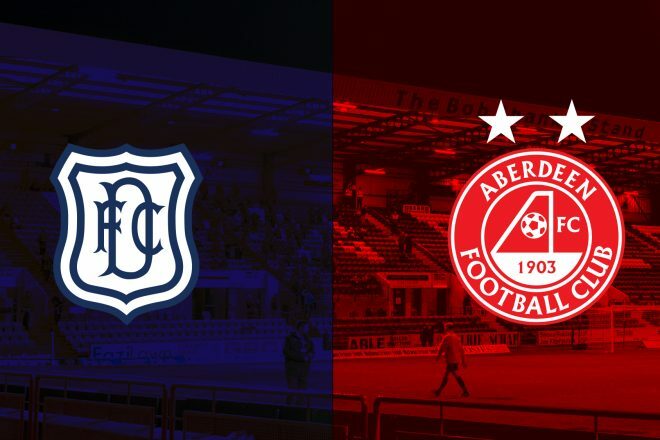 No Aberdeen team has lost in the league against the dark blues in Dundee since December 2004, although Derek McInnes’s side suffered a Scottish Cup exit in his second season in charge. 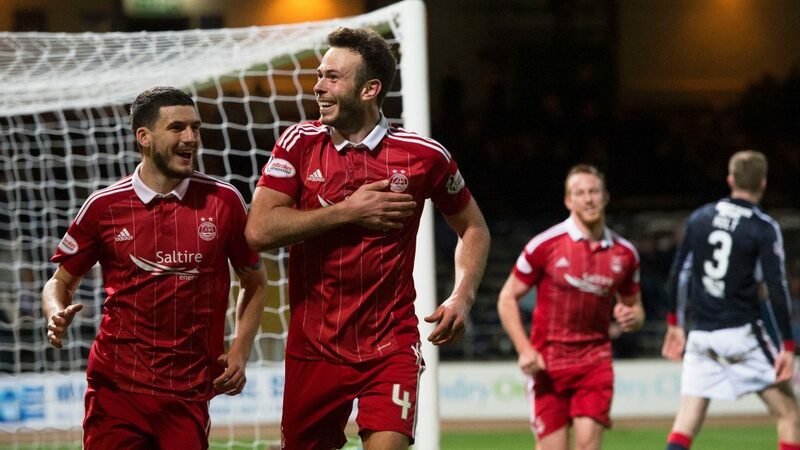 The biggest Aberdeen victory came in the 7-0 win two seasons ago when Andy Considine scored an unlikely hat-trick, but the first ever encounter between the sides saw Dundee romp home with a 6-0 victory back in 1905-06 season. 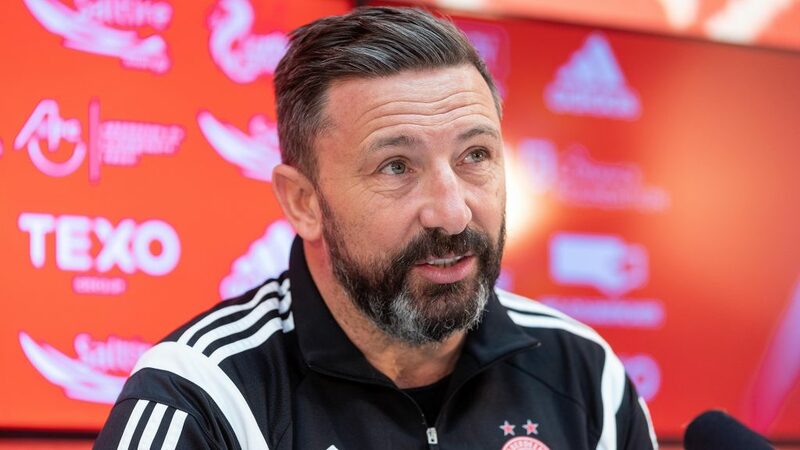 Derek McInnes has never lost a league match against Dundee as manager of Aberdeen with 12 wins and four draws in his 16 matches. If you can’t make the game in Dundee make sure to tune into our RedTV coverage from 2.45pm. International supporters will be able to watch the game with commentary provided by our colleagues at DeeTV. Post match we will have reaction, goals, highlights and a full match replay. Thank you for your fantastic support once again. 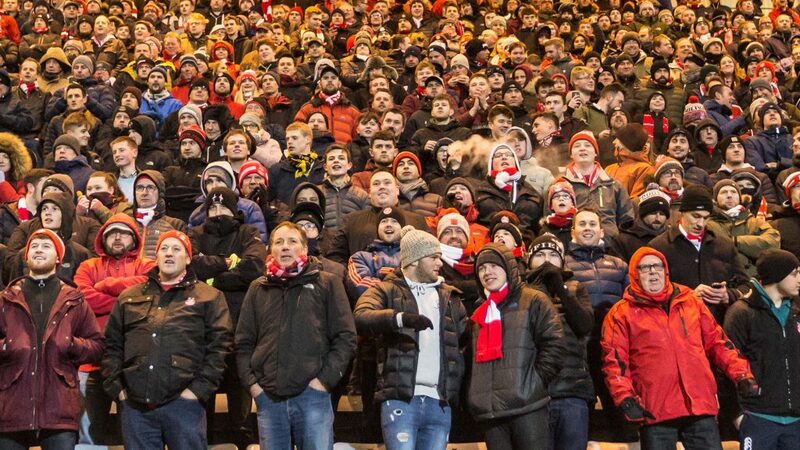 We look forward to seeing the Red Army down in their thousands again! 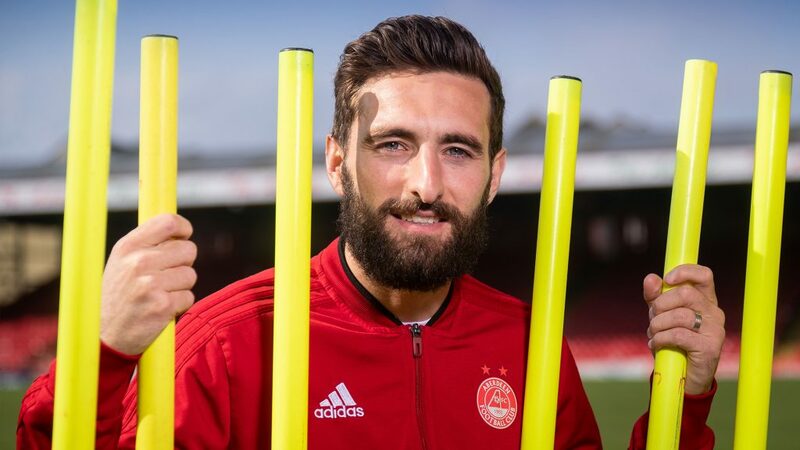 In the third minute fine play by Graeme Shinnie gave Connor McLennan space to run into and when he was taken down by Darren O’Dea on the edge of the area, Aberdeen had a free kick in a great position. It was a couple of yards in the from the junction of the box. Lewis Ferguson fired in a shot which deflected behind for the games first corner. That was cleared but the Dons kept the pressure on until McGinn’s cross went harmlessly behind. Frustrating as Aberdeen had worked the ball into a good area. From the goal kick Jesse Curran got the better of Considine and from the flick on John O’Sullivan got the better of Dom Ball, he got himself into a great position to pick out a blue shirt in the box but Ball did well to get back and recover the situation. The resulting corner was cleared but then Jesse Curran found space on the left, again though the cross was poor and McKenna was able to clear. A warning for the Dons though. On 12 minutes McKenna produced a fine solo run from the half way line which won a corner. McGinn floated it into the back post for the onrushing Cosgrove, but there’s a foul against the Aberdeen man. On 24 minutes a Craig Curran shot from 30 yards never threatened Joe Lewis’s goal and the ball went over. It was the first real shot of the game though. After 33 minutes the game was stopped for a while as Connor McLennan received treatment. Although he looked in some discomfort, he was able to continue. Dundee kept the pressure on and Jesse Curran’s cross was deflected behind for a corner. McKenna headed clear and Aberdeen were able to get themselves back up the park. On 37 minutes Darren O’Dea was forced off with an injury and had to be replaced by Genserix Kusunga. Dundee continued to enjoy a good spell and ask questions of the Aberdeen defence. After 41 minutes the Dons appealed for a penalty as McLennan’s cross into the area struck McGowan from close range. The ball appeared to hit his stomach and not an arm. As half time approached Ethan Robson, who had impressed in the first half, had a shot from distance which produced a routine save from Lewis. On 55 minutes really nice link up play by O’Sullivan and Curran created a shooting chance for Callum Moore, the Dons defence did well to get out and make a block. The ball deflected behind for a corner. There was a lovely back heel from John O’Sullivan in the move. A minute later O’Sullivan twisted and turned away from Ball, hit a shot from 30 yards which for a second appeared to be going in until Lewis tipped it over bar. It proved to be a vital save at a vital time – something Joe has done all season. On 83 minutes Kenny Miller latched onto a long ball, he cut inside onto his left foot but fired well over. It was probably Dundee’s best chance of the game and the experience striker will know himself that he should have done better after creating room. The keeper then also made a fine save as he tipped a Ferguson free kick onto the bar. Excellent effort from Lewis. He also saved Stevie May’s 30 yard shot which was going in.